HCG Drops are a slimming product that has caused quite a stir in the USA lately. These drops promise a significant weight-loss potential of up to 1 lb per day. Let’s see what these drops are, how they work, if they are safe, and finally, if the product is really worth trying. HCG Drops are derived from Human Chorionic Gonadotropin. This is a placental hormone which is produced during pregnancy. HCG weight-loss properties were first established in 1960 by the British endocrinologist Albert T.W Simeons. Simeons tried a combination of a strict 500-calorie- per-day diet with the injection of HCG to overweight subjects. The result was a quick reduction in body fat. Today, there are two basic methods of applying HCG. One is through the injection of HCG and the other is through HCG drops, which are either synthetic or homeopathic. In both cases, a strict 500-calorie-per-day diet is applied and a rapid reduction in body fat ensues – at least in theory. At the same time, muscle tissue is supposed to remain relatively unaffected. The HCG injections approach, coupled with the 500-calorie diet, has stirred much debate and controversy in the scientific world due to its high claims. Many renowned medical journals (such as theAmerican Medical Association and the American Journal of Clinical Nutrition) have publicly opposed the use of HCG injections as something both ineffective and unsafe. While studies have shown that older men who are facing problems due to androgen deficiency might be benefited from HCG injections, there was no replicable and solid evidence that HCG injections can perform as they claim regarding their weight-loss potential. Just like the case with HCG Injections, there is no credible scientific study in which HCG drops – whether synthetic or homeopathic – have any positive weight-loss effect. Elizabeth Miller, the FDA official responsible for Internet fraud, stated that there are no over-the-counter HCG products which can have effective weight-loss results. While receiving only 500 calories a day will help a person reduce their weight, this is not possible to happen because of orally ingested HCG drops. 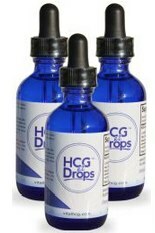 From a scientific standpoint, orally ingested HCG drops will be neutralized in the digestive system, and thus they can’t be expected to offer any slimming benefits. Besides, even the content of products with HCG drops varies widely regarding their composition – with some containing no HCG at all and others containing undetermined trace amounts. It seems that HCG related products are a disappointment. While you may experience a significant weight loss if you stick to a 500-calorie-per-day diet, it is unlikely that you will be aided in your effort by HCG injections or drops. Scientific evidence regarding HCG drops is quite conclusive that all these are false claims. Our opinion is that there are other similar slimming methods such as the Activ8X, which do work with a similar level of dieting (500 calories per day). However, their way of operation differs significantly since they are used to curb the hunger associated with such strict diets.